We saw this and wondered if it was coincidence that there was a police presence whilst Mr. Jordan was visiting Somerset yesterday? It's clear that the EA have a way to go if they are to recover the confidence of inhabitants of the Somerset Levels - really - is this just coincidence? - or does it illustrate some jitteryness about the quality of welcome for senior EA officials down there? An inept bit of photo-op or a not so subtle signal to the uppity natives ? We wonder where Richard Creswell has gone - the EA SW regional director covering the Somerset area is essentially MIA and seems to have been quietly disappeared - one wonders if he's been gagged and paid off like so many folk involved in EA shennanigans... how much we wonder? 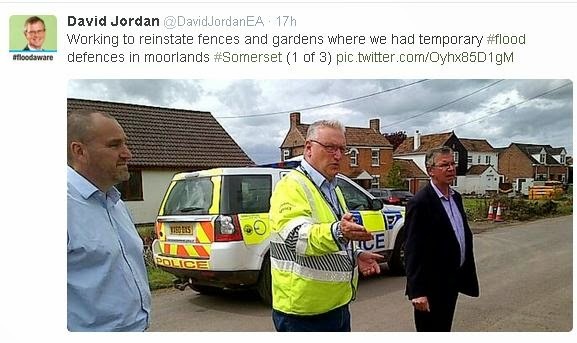 Mr Jordan seems keen to be seen associated with "gifts to the natives" - but rather less keen to address the consequences of his actions in the matter of Somerset Levels drainage management in the past eh? NOT TO BE TRUSTED he should be in that police car. Unless you zoom in on the image it looks as if he is handing out hi-viz yellow sponges to mop up the water. This could of course be construed as bribery. When you zoom in there is nothing in his hand it is the yellow paint on the Police car, he is empty handed. Which is probably what the EA will end up giving Somerset, nothing. I thought maybe the Police were there to arrest him for corporate vandalism, flooding large areas of a county. At least it should qualify for an ASBO. Being put out of your home by anyone should be counted as anti social. Also why is he wearing Hi Viz after all he is simply standing in the street talking. I suppose it saves him money wearing an EA provided PPE than his own clothes. It looks like the PPE industry is gearing up for a big new order of hi-viz PPE for EA managers and executives >> £20 will get you a suitably startling get-up >>> ROLL UP!! for the show!! DEFRA Acknowledge "EA out of control"?